Customers, including Levi Strauss & Co*, Honeywell* and Yanzi*, demonstrate smart things in everything from industrial wearables to retail to smart buildings, all powered by the Intel IoT Platform. Intel is working with a variety of companies across market segments to scale from a proof of concept to pilot to deployments.Levi Strauss & Co.* collaborated with Intel and implemented a proof of concept for the Intel IoT Platform to address inventory management in three of its stores. The proof of concept allows the Levi's stores to gain visibility into what's on the shelf or what might be running low, making the process of inventory management more effective, so when the consumer comes in looking for that exact size and color jeans, it's on the shelf. 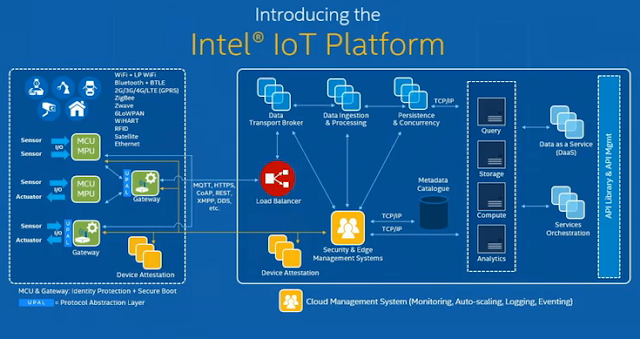 The new Intel IoT Platform reference architecture for smart and connected things is focused on enabling the broad Intel ecosystem to simply develop, secure and integrate smart things. The platform provides a blueprint for delivering innovations to market faster by reducing complexity and defining how smart devices will securely connect and share trusted data to the cloud. The first company to announce IoT solutions based on the new Intel IoT Platform is SAP*, which will develop its IoT enterprise end-to-end solutions utilizing the Intel platform along with its SAP HANA Cloud Platform*. To collect data on everything from space utilization to lighting usage in an office building, Yanzi*, a smart building provider, is using the new Intel Quark SoC to develop the Yanzi Plug* and Yanzi Motion*. The plug is an energy monitoring sensor that enables optimized energy use based on space utilization and predictive maintenance in smart buildings, in addition to providing analytics at the edge and in the "thing." The solution results in decreased operating expenses and total cost of ownership of IoT systems in smart buildings.